Across the nation, small towns take the cake for being some of the most charming destinations in Australia. Nestled about 320km south of Darwin in the Northern Territory, the town of Katherine is where the outback meets the tropics. While the major cities throughout Australia are excellent for the hustle and bustle of large city lights, Katherine takes a different approach. Journey through the Northern Territory to a place that still preserves ancient cultures with a scenic backdrop of rugged terrain. Explore waterfalls, hot springs, canyons, and ever-changing landscapes that weave their way across the territory. A must visit are the hot springs just minutes away from the town centre. Have a refreshing dip in the crystal-clear springs, perfect for reenergising. Forewarning: the hot springs may be closed during wet season (from November to April). In contrast, the wet season is the perfect time to see waterfalls and the lush rainforest landscape re-emerge. Take a trip to the oldest original homestead within the Northern Territory. Built in 1879, the grounds are abundant with wildlife such as exotic plants and wallabies. Take a tour of the homestead and chill out in the tranquil swimming pool, or for the more intrepid, experience an adventure canoeing along the Katherine River. Historic treasures and well-told stories await. Learn about the local aboriginal culture and the early settlers’ way of life with a variety of artefacts, historic images, maps, all within the old air terminal from WWII. A real Aussie outback experience. Award-winning country music artist Tom Curtain hosts a 90-minute show on an authentic Australian cattle station. What you can expect: a lesson on how to break-in horses, working dogs rounding up cattle, Tom performing a few musical hits and insightful stories of the bush. Immerse yourself in indigenous culture with local programs. Learn how to create fire with two sticks, perfect your boomerang and spear-throwing technique, and create a dot painting of your own – the traditional way. There are also five art galleries to stroll through; be sure to admire works completed by original Katherine talent. Be swept off your feet by local displays of carvings, artwork, locally woven knick-knacks, and more. The Culture Centre showcases a permanent exhibition called the Blanasi Collection, featuring works completed by elders from the western Arnhem Land region. Don’t forget to take a look at the old Katherine railway station, explore the cycling trails, or try your luck at a few local fishing spots. Make the most of this captivating pocket in the outback. The main attraction. Drive 30 minutes to one entrance or 45 minutes to another (both worth exploring). 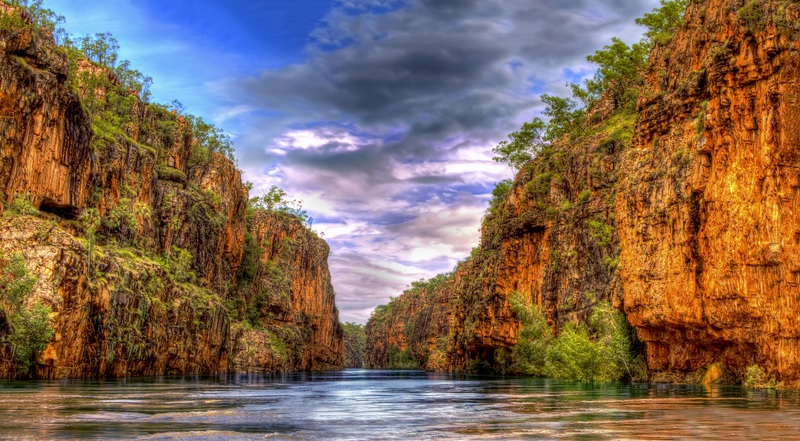 Nitmiluk National Park is just north of Katherine and south of the famous Kakadu National Park. Canoe through the famous Katherine Gorge, embark on a cruise or go bushwalking on one of the various trails through the resplendent nature of NT. 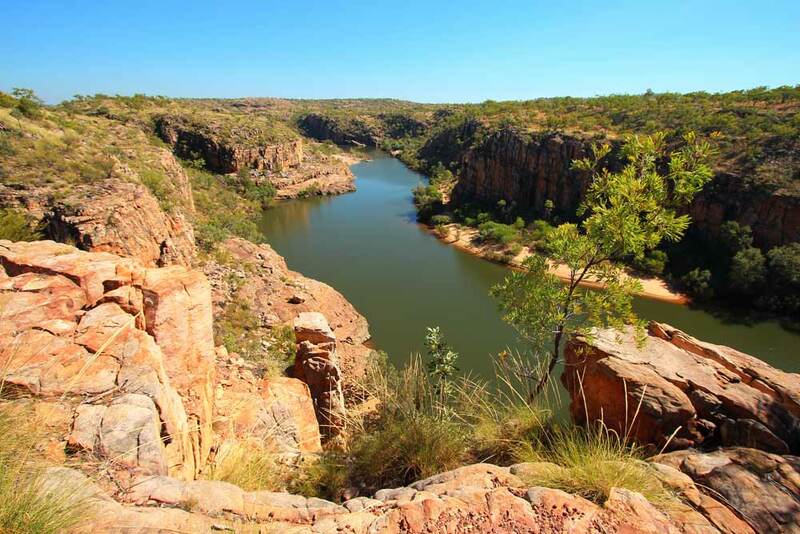 Running from Arnhem Land to the Timor Sea, the Katherine River has carved 13 sandstone gorges. Depending on the season, you’ll be in for a different experience. Dry season breeds a peaceful ambiance on the river, perfect for paddling. During the wet season, the waters deepen and rapids rush through the gorge. Journeys through the gorge will take at least a day to complete (whether by canoe, cruise or bushwalking). Nitmiluk Tours can be contacted for information regarding cruises, activities, and accommodation. The Jawoyn Aboriginal people are the traditional landowners of the Nitmiluk National Park. The guides of the local Jawoyn people help visitors explore the Katherine Gorge while teaching guests about the indigenous history. The guides will introduce you to the vibrant local culture and a refreshing way of life. If you are an experienced hiker, the Jatbula Trail is a quest you won’t want to pass up. Five days and 60 kilometres will wind you through the Dreamtime track of the Jawoyn people, ancient grounds rarely seen by those less daring. A 25-minute drive south transports you into another world dating back 500 million years. The Cutta Cutta Caves are stunning limestone crystal caverns with mesmerising stalactites and pillars that sparkle in the dim cave light. A boardwalk takes you through the hollows for a chance to marvel at the historic structures and see a few of the rare bat species living within. Travel here to swim in the natural pools or spend a night or two camping in a serene forest setting. There are ample bushwalking opportunities including the Leliyn Trail (2.6km return, 2-hour circuit) and the Sweetwater Pool Trail (8.6km return, taking a day or overnight to complete). Edith Falls is also the end point of the 60km Jatbula Track (the track begins at Nitmiluk National Park’s Katherine Gorge). Drive 1 hour and 15 minutes southeast to Elsey National Park to soak up the sun in the warm water of the Mataranka Thermal Pools and Rainbow Springs. Surrounded by tropical woodlands and plants such as pandanus, paperbarks and palms, channel your inner Zen. Take a short 15-minute drive to the nearby Bitter Springs, another spring-fed thermal pool where relaxing hues of blue flicker across the water. 194km west of Katherine is the Victoria River Crossing. This is where the highway crosses the Victoria River, creating a dramatic panorama of scenic sandstone cliffs across the east section of Gregory National Park. The Victoria River Roadhouse is west of the bridge, offering river views, food, accommodation, and an array of wildlife at your doorstep. If you have time to kill in the Northern Territory, 7 hours west sits Keep River National Park. This park is known for its stunning bushwalks and ancient geological structures dotting the landscape. 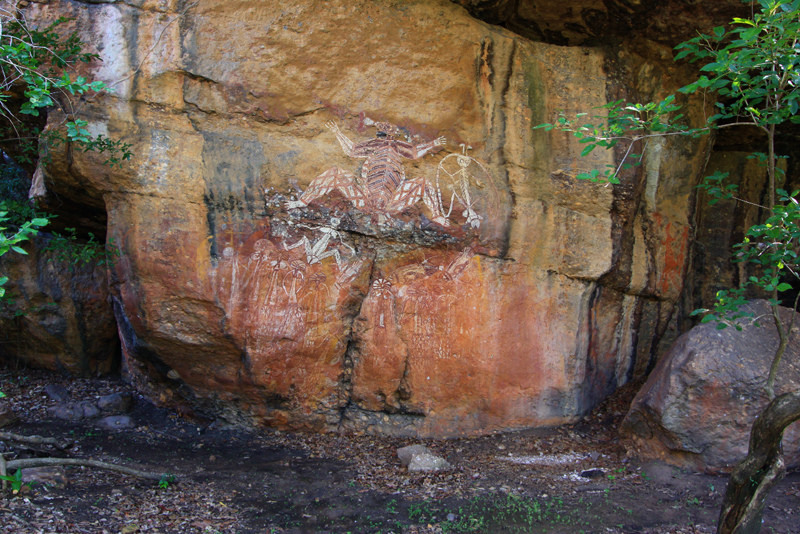 The spiritual, detailed rock art unravels centuries of history. One of Australia’s best kept secrets, don’t miss trekking through a variety of trails to experience art’s test of time (especially the Jarnem Loop – 7.5km return). There are camping grounds 18km into the park at Gurrandalng and Jarnem (32km into the park). 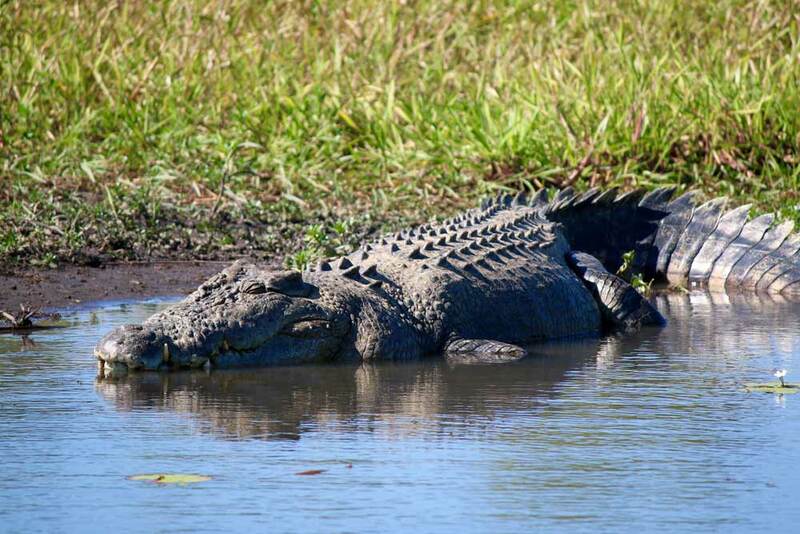 All travellers should be alert for crocodiles within the area. As the largest and one of the most famous national parks in Australia, Kakadu boasts World Heritage-Listed sites, scenic views, striking aboriginal rock art, and untamed wilderness. Embark on a 4WD tour through waterfalls and trails along the lush woodland trails, take a cruise in the heart of the Kakadu wetlands for an unforgettable wildlife experience, or road trip through various portions of the park (including the bordering Arnhem Land) for an authentic Aussie experience – where the outback and tropics both prevail. Placed next to the Visitor’s Centre, enjoy a cuppa of Katherine’s best coffee. Hungry? The caravan boasts a selection of toasties, cakes and donuts. Grab a hearty brekkie or filling lunch at The Coffee Club. In a fresh, contemporary space, start your day off right with a diverse menu choice and the delectable taste of Katherine coffee. A classic al-fresco dining experience in an outdoor garden restaurant. Surrounded by tropical vegetation and the splendours of nature, the restaurant and bar are a part of the Knott’s Crossing Resort. On the grounds of the Katherine Art Gallery, enjoy an authentic Aussie bush tucker dinner – a traditional meal by the campfire at Marksie’s Stockman’s Camp. Only 7km outside the town, get ready for an evening of good food and good company. Tropical beer garden, top-notch restaurant, refreshing swimming pool – enough said. 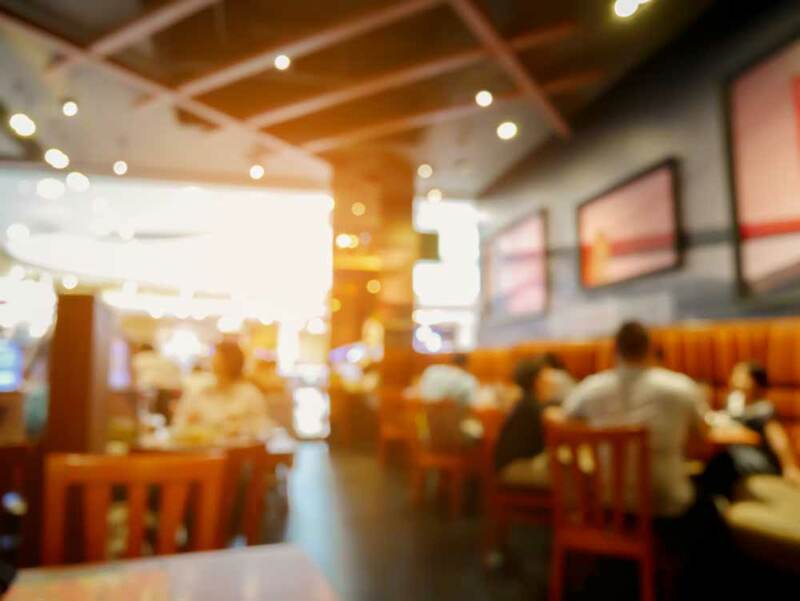 With music and entertainment on the weekends, enjoy a gourmet meal for dinner and carry on with a couple refreshing drinks throughout the evening. The hotel also offers accommodation for those passing through. To sate your craving for Asian cuisine, try this local venue frequented by travellers and locals alike. Great food, service and generous portions bring this eatery up in the restaurant rankings.